The quick guide to ensuring a happy, healthy life for your guinea pig! Did you know, if properly cared for, Guinea pigs can live up to 6-7 years on average? Guinea pigs are very fun and rewarding pet to have, they are not as demanding as other popular small pets but they do need continuous attention and gentle care. Guinea pigs are social animals and live in herds in the wild. It is best if you have at least two guinea pigs living together. Guinea pigs living alone have a tendency to get lonely, are less curious, less vocal, and less active. 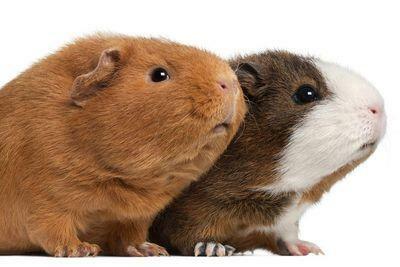 When living with another guinea pig, they’ll communicate, play, and run around more. You’ll also be able to watch them cuddle up and sleep together, which would melt anyone's heart. Guinea pigs also love to eat! They are the type of animals that are happy grazing all throughout the day instead of having set eating times like cats and dogs. The basics necessities that all guinea pigs need to have at all times are hay, fresh water, and guinea pig pellets. They also need to get enough Vitamin C so they also enjoy getting fresh veggies and the occasional fruit treats. Just like with any animal, a guinea pig can have a sensitive digestive system, which can be easily upset. Always introduce new foods to your pet slowly and patiently. Why hay? Guinea pigs teeth are continually growing, so they need to constantly graze and chew on the hay to help prevent their teeth from over growing. Eating hay also helps keep their digestives system moving and in good health. When buying hay, avoid dusty, brownish hay with a neutral or bad smell. The hay should smell nice and have a greenish color to ensure it’s fresh and healthy enough to feed to your guinea pig. Be careful to avoid straw, which is brown, much harder, and has virtually no nutritional value. In regards to vegetables, some can be given daily while others should only be given a few times a week. Healthy vegetables that your guinea pig can eat daily include cucumbers, carrots, green leaf lettuce, zucchini, and green and yellow bell peppers with the seeds removed. Vegetables that guinea pigs can have occasionally include asparagus, diced tomatoes, red and orange bell peppers with the seeds removed. Remember to remove any uneaten vegetables at the end of the day to prevent them from spoiling in your pets enclosure. Fruits should only be provided occasionally as a treat once or twice per week. Fruits are full of natural sugars so too much could lead to bladder problems. Peaches, raspberries, and blueberries are all great to give as treats but remember to only feed in moderation. Stay away from grapes as they are believed to lead to kidney disease. Guinea pigs need a large living area with plenty of room to run around, stretch, play, and express their personality. Enclosed cages like aquariums are not recommended. Aquariums have low air circulation, which could lead to the buildup of ammonia. This also rises the risk of mold formations and bacterial growth as well. Since guinea pigs are prey animals, they need multiple hiding places within their enclosure for a sense of security and protection. Remember to clean your guinea pigs enclosure on a regular basis. Supply your guinea pig with bedding to play and sleep in. Avoid using cedar bedding because it can cause harm to the respiratory tract and liver. Just like dogs and cats, guinea pigs need to have their nails trimmed every few weeks. If you have a long-haired guinea pig, they will also need to have hair cuts on occasion. Long hair can get wet, dirty, and provide a good infrastructure for bacterial growth. There is no general rule for trimming guinea pig hair, but take into consideration temperature, season, and the length of your pets hair. Although guinea pigs rarely need baths, it is recommended to wash them gently every few months in warm, clean water. Always avoid getting water into and pets ears as it could cause problems. Guinea pigs are very vocal creatures! They will always let you know exactly what they want, but whether you understand them is a completely different subject. They will vocalise their needs ranging from excitement, hunger, tired, or upset. Once you spend more time with your guinea pig you’ll be able to tell all their sounds apart. Guinea pigs are also very active. “Popcorning” is a behavior in which your guinea pig exhibits hopping up in the air, running around, quickly turning in another direction, and repeating the jump. This shows that your guinea pig is happy, excited and being playful. When your guinea pig senses danger they will freeze and stand motionless, pretending to be invisible. Guinea pigs are cuddly, comical, and clever. They make wonderful pets and are very social animals. They do better in pairs, and will talk a lot. Before you know it, your little friend will be calling for you when you’re out of site. Remember to give your guinea pig a big enough enclosure to run around and play in, but also enough hiding areas to feel safe and secure. Always have hay, fresh water, and pellets available for your guinea pig and remember to feed them vegetables and fruits in moderation . Clip your pet’s nails often, brush and bathe them when needed, check their teeth to ensure they aren’t too long, and keep an eye on any changes with diet and personality. With enough love and proper care, your guinea pig will live a long and healthy life with you!